Fills gaps in water quality monitoring: Volunteer monitoring provides data on water quality in lakes and ponds for which there is little data otherwise collected. Supports water management decisions: The data produced by this monitoring supplement state watershed assessments, allow tracking of changes in water quality as pollution management actions are implemented, identify new water pollution problems as well as high-quality waters, contribute to the refining and updating of nutrient water quality criteria and standards, and support TMDL implementation and stormwater management. There are thousands of freshwater streams, ponds, lakes, rivers, beaches, and wetlands in Rhode Island; for example, there are almost 150 lakes covering over 20 acres across the state. Although state-led monitoring projects cover many water bodies in the state, funding constraints and practical issues leave many remaining water bodies without regular monitoring. In the absence of sufficient state funds and agency bandwidth, Rhode Island depends on the efforts of trained volunteers—also known as citizen scientists—to monitor hundreds of sites. Photo courtesy of URI Watershed Watch. Volunteer-based monitoring has multiple benefits. Data collected are an important source of water quality information for lakes, ponds, streams, and beaches, and the data are shared with the RI Department of Environmental Management (RIDEM). RIDEM then uses these data to help prioritize restoration efforts and meet Environmental Protection Agency data reporting requirements under the Clean Water Act. Local partners also use the results to understand, protect, and restore Rhode Island waters. Volunteer monitoring actively involves communities in the management of their natural resources. By engaging citizens, the program helps people understand the importance of natural resources in their backyards and encourages them to participate in the management process. Public participation improves the quality and effectiveness of the management decisions. 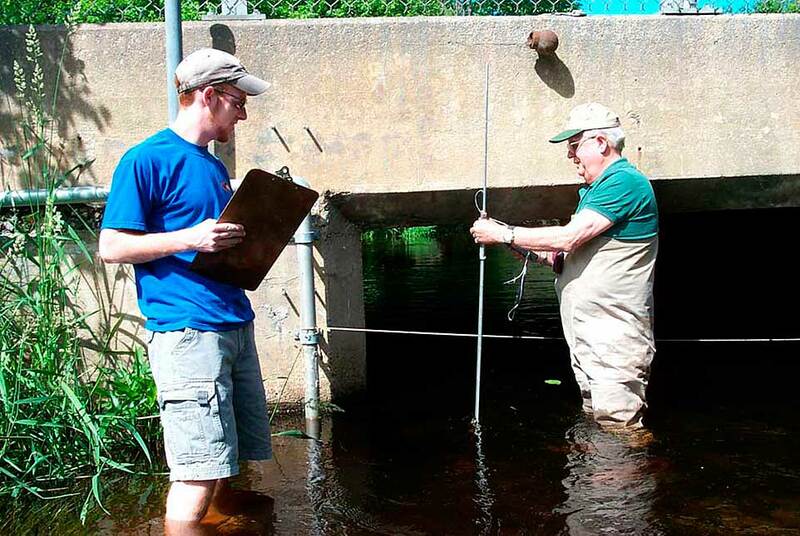 URI’s Watershed Watch program (URIWW) is one such volunteer water quality monitoring program. URIWW works with local communities to provide equipment, training, supplies, and data analysis for water quality testing conducted by private citizens in 29 cities and towns in Rhode Island. URIWW is the largest citizen scientist-led volunteer monitoring program in the state, with over 250 sites and 350 volunteers. Data collected by URIWW from lakes, rivers, streams, and coastal waters provide information on water conditions that supplement the state’s periodic rotating assessments. 2017 marked the 29th year for URI WW volunteer monitoring efforts and volunteers monitored 67 lakes and ponds, 71 river and stream sites, and 77 salt water and estuarine sites during the monitoring season. At the end of the season, there were 177 five-plus-year volunteers (including families), 94 ten-plus-year volunteers, 46 fifteen-plus-year volunteers, 25 twenty-plus-year volunteers, and seven volunteers who have monitored for twenty-five or more years. The most senior volunteer is 92, and was featured in a front-page article in the Providence Journal.